Q. Does the library contain any information on early employees at the Corning Glass Works? 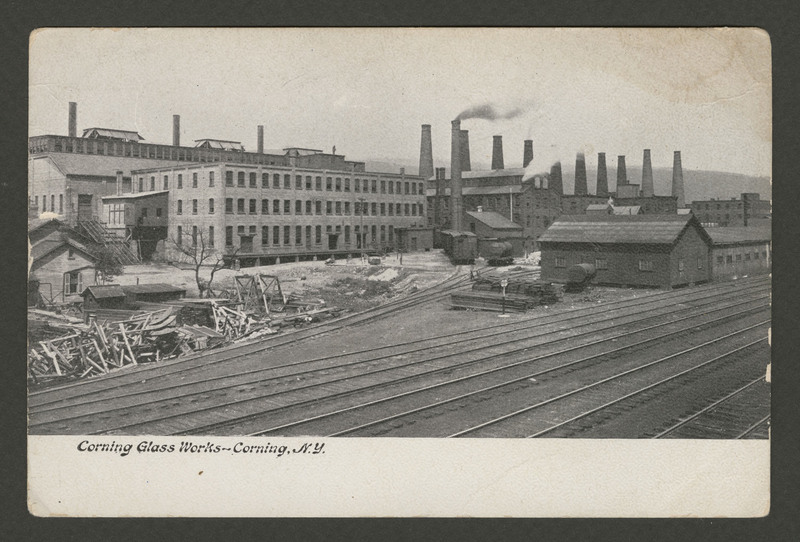 Image: Corning Glass Works Corning, N.Y. Postcard. Philadelphia: J. Murray Jordan, 1905. Rakow Research Library, Bib ID: 63266. Hello! Thank you for your question. Unfortunately, our collections do not include personnel records for Corning Glass Works or Corning Incorporated. Factory workers can be difficult to trace because they are recorded infrequently in published literature and our archival collections currently contain few employee records. For the Corning area, we encourage you to contact the Southeast Steuben County Library to gain a greater understanding of genealogical resources that are available: (607) 936-3713. The Rakow Library research guide on Corning, New York: The Crystal City may contain some information of interest as well. The Library also has 1950, 1951, 1954, 1966, 1967, 1969, 1970, 1972, 1973, and 1974. Sweetwood, Mark M. The First Century: The Leader Looks Back at 100 Years in the Crystal City: City of Corning, 1890-1990 Centennial. Corning, N.Y.: The Leader, 1990. *Dates reflect library holdings rather than publication dates. Cullet. [Corning, N.Y.]: Published by employees of Corning Glass Works, 1919-1922. Corning Glass Works Gaffer. Corning, N.Y.: Public Relations Dept., Corning Glass Works, 1943-1952. Corning Glassmaker. Corning, N.Y.: Corning Glass Works, 1953. Gaffer News. Corning, N.Y.: Corning Glass Works, 195?-1962. The Glass Sil-o-ett. [Charleroi, Penn. ]: Charleroi Plant, Corning Glass Works, 1960-1977. Corning Gaffer. Corning, N.Y.: Corning Glass Works, 1962-1975. Corning Magazine. Corning, N.Y.: Corning Glass Works, 1968-1969. The Gaffer. Corning, N.Y.: Corning Glass Works, 1975-1989. More extensive resource lists on Corning Glass Works, Corning Incorporated, and the Corning area are available on request. Please let us know if we can be of further assistance via Ask a Glass Question (http://libanswers.cmog.org/), email (rakow@cmog.org), phone (607-438-5300), or text (607-821-4029). Please do not hesitate to contact us with your glass-related questions in the future! Can the library help me with genealogy? Does the Library have information about Corning Incorporated?